Astrill VPN hasn’t made it as an elite VPN service provider. This review will show you why. The first thing you should know about Astrill VPN is that this VPN service provider is based in Seychelles. This means that Astrill and its customers don’t have to worry about overreaching government agencies. Astrill VPN is not strictly a personal VPN service provider. It also provides other solutions such as business VPN and VPN routers. For this Astrill VPN review though, we’ll stick with the personal VPN service. On the face of it, you might think that Astrill VPN is a high-end VPN provider. Maybe you also think that it is one of those VPN service providers that offer a ton of perks with each of its packages. Afterall, Astrill offers servers that are located in over 49 countries. This means, that Astrill is one of the best VPN service providers if you are looking for unblocking and spoofing functions. Astrill also has a Windows client that comes packaged with rich features. The Windows client allows users to toggle on and off a ton of options. Options such as the ability to use different encryption methods. The Windows client also protects users against DNS leaks. It also has protection against IPv6 leaks and comes with a Kill Switch that keeps you safe even when you don’t have an internet connection. These are some really advanced features. And that’s why you would only see them with only the best VPN service providers. Astrill has given as a high amount of evidence that it has all it takes to be a great VPN service provider. Well, Astrill doesn’t have a decent Android client. Which is a shame since it has a great Windows client. Moreover, Astrill encryption technologies are a bit lacking. We’ll discuss that later in this Astrill review. The Windows client is also a bit complicated to use for people who are new to VPN services. It is a good thing that most of the settings that matter are already set to default. Hence the user doesn’t have to do anything to get Astrill VPN to work. 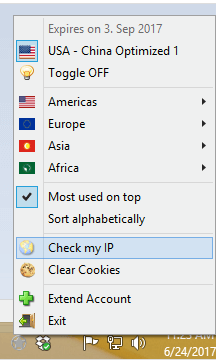 New users are better off using the drop-down menu which is located at the top corner of the Windows client and then select the OpenVPN connection. Astrill VPN says that it has set its default encryption to its proprietary OpenWeb*. 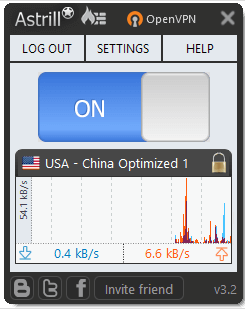 If new users don’t mess around with the settings too much, Astrill VPN should provide them with a smooth experience. Most of the current VPN service providers in the market today offer multiple packages. Most of those packages come in the monthly terms. With Astrill VPN that isn’t the case. Customers who sign up with Astrill VPN for a period of three months can do so for as low as $10 per month. If they subscribe to Astrill VPN for a full year then Astrill VPN provides them with a further discount. Our calculations show that a yearly subscription package would cost you just under $5.83 per month. The prices are reasonable, to say the least. Of course, you’ll have to read the full review to find out if Astrill VPN is even worth this little money. As far as subscription packages go, it’s not all sunshine and rainbow. By that we mean, customers who sign up for the service for a period of three months will have to deal with at least one downside. And that obvious downside is that customers will actually have to commit to the service without knowing in advance how good or bad it is. So what’s the solution to this problem then? 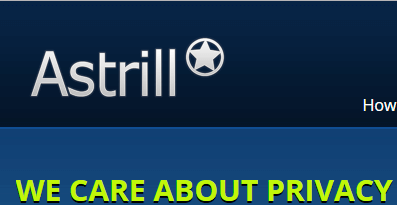 Well, Astrill offers users a free trial. You can test the service for a period seven days without paying anything. After checking Astrill VPN, you can make your decision if you want to make the purchase or not. But purchasers of Astrill VPN must keep in mind that money-back guarantee only applies to those customers who have not taken advantage of the free trial. If a user takes the seven-day free trial then Astrill VPN will consider you unqualified for a money-back guarantee claim. Because they are of the opinion that you had plenty of time to test the service out in the seven-day free trial. Hence you shouldn’t need a money-back guarantee after using the free trial option. So if you aren’t sure about Astrill VPN, it is better to not sign up for the full year. Then you can easily change your mind without incurring huge costs. You can engage in P2P downloads if you wish. But you will have to use the StealthVPN mode or OpenVPN connection to engage in P2P file transfers. Astrill VPN has some useful advice for you on its official website so you should check that out if you are serious about using BitTorrent with Astrill VPN. That advice mostly boils down to using OpenVPN or StealthVPN mode. The official website also tells you to use either manual forwarding or automatic forwarding for your P2P downloads. As mentioned at the top as well, Astrill VPN has around 49 regions which act as bases for its VPN servers. They are located all over the world. 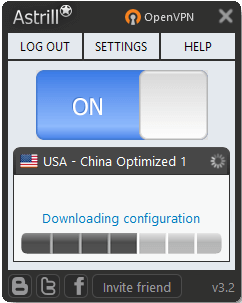 Moreover, all Astrill VPN users are qualified to take advantage of West and East Coast US-based VPN servers. There are a total of 27 VPN servers in the US. As far as VPN server location selection is concerned, Astrill VPN scores high marks. If there is one thing good about Astrill VPN then it is its selection of VPN servers. As pointed out earlier as well, Astrill is based in the region of Seychelles. Hence, it doesn’t really come under any jurisdiction of strict governments and their agencies. For a VPN service provider and a VPN user that is good news. Because it makes it easy for a VPN service provider to protect its user’s privacy. Moreover, it gives Astrill VPN a definite plus over its rivals that are located in the US and/or EU. We have also come to know that Astrill VPN does not cooperate with third-party companies to exchange data in return for some monetary benefit. That means, your data is safe. Astrill VPN will not share it with marketing companies and the like. We don’t know of any other reason why would a VPN service provider share data with another company other than to make money or for advertising purposes. Astrill says that the company does not keep any usage logs. This is also pretty good for a VPN service provider. Astrill says that since Astrill did not keep any logs on its subscribers, even if law enforcement agencies wanted something, the company wouldn’t have anything to give to them. As we have mentioned before, Astrill is based in Seychelles. Hence such zero-log and no data-sharing policies should not be hard for Astrill to keep well into the future. Well, the company records the previous 20 connection logs. These logs contain information such as when did the user connect to the Astrill servers and for how long. The company says that it deletes these connection logs as the user creates more than 20 connection logs. Astrill does not keep connection logs past your 20th connection attempt. There are better VPN service providers in terms of logs, but Astrill is no slouch. Of course, if you want absolute zero-logs then you should look someplace else. As mentioned at the top as well, Astrill offers a ton of encryption options. Most of these options are present within the company’s Windows client. OpenVPN is probably the only VPN encryption option that is genuinely secure. OpenVPN comes with many cipher options and Astrill Windows client offers them to the user with ease. Users can make use of many cipher options. Camellia 128-bit along with Camellia 192.-bit and Camellia 256-bit. Cast 128-bit and CAST 192-bit along with CAST 256-bit and CAST 512-bit. AES 128-bit and AES 192-bit along with AES 256-bit. BlowFish 128-bit along with BlowFish 192-bit and BlowFish 256-bit. There is also the cipher option of BlowFish 512-bit. You don’t need us to tell you that Astrill has an incredible list of cipher options. Astrill offers non-Nist Camellia and that is great. We highly recommend that you use that option if you want to. What about the handshake technology? Astrill uses hash authorization and Perfect Forward Secrecy. We don’t know more details about how Astrill implements it because Astrill says that is classified information. Because of that, you can safely assume that Astrill doesn’t implement its encryption with any competency. Astrill makes use of OpenWeb protocol as the default option in both its Android and Windows clients. We will give you marks for not knowing. Because OpenWeb is a relatively unknown encryption protocol. It is basically Astrill’s proprietary VPN protocol option. Hence no one really knows much about it. If you are concerned about your security and privacy then don’t go for this option. We will advise that you use VPN protocols which are industry standard and trustable. Astrill representatives would tell you that their OpenWeb protocol option worked like a good proxy service within the web browser. Moreover, Astrill says, users don’t have to install it as an app in their web browsers. That means you don’t know what impact it has on your privacy. OpenWeb is also not open source. You should always exercise caution when using closed source technologies. And it is proprietary, which says a lot about Astrill VPN. The Android client doesn’t have such options though. 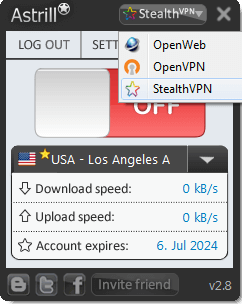 In the Android client, you can either use OpenWeb or StealthVPN. The default encryption is AES 256-bit. But Astrill VPN does not make use of hash auth and/or handshake. Hence, the Android client isn’t as secure as the Windows client. You won’t find much information about how Astrill VPN ensures Perfect Forward Secrecy. Which is again a mystery. And Astrill VPN loses marks for that. The official Astrill website is easy enough to navigate. It is also fairly simple. The self-explanatory layout of the website basically leaves nothing for us to guide you on. Don’t expect the Astrill VPN official website to have a flashy feel though. And unlike other VPN service providers, Astrill VPN doesn’t use its official website to sell itself more than necessary. The official website gives the user a lot of variety in terms of options. But most of these options aren’t useful for the beginner VPN users. They are aimed towards experienced ones. Some sections of the site are only for businesses. Hence, a user who is only interested in a personal VPN service would do well to ignore the vast majority of the content that is available on the official website. But it never it never hurts to have extra information just in case you need it in the future. As mentioned before, for the majority of online users, the website offers more than enough. All you really need to do is to download the official Astrill VPN client. But remember to do so for the right platform. That is the one you are running right now. Astrill VPN has VPN client software applications for almost all major platforms and operating systems. We’re talking about iOS, Android, Mac, Linux and of course, Windows. Astrill VPN mainly provides its customer support via a ticketing system. But it also has other options such as a 24/7 live chat feature and emails. Expect Astrill VPN representatives to answer your questions within a few short hours. That isn’t long by any stretch of the imagination. Our research for this Astrill VPN review shows that the company’s tech support is good and responds on time majority of the times. Don’t expect the representatives to have absolute knowledge about your problem every time you have one though. But expect them to help you by connecting you to the developers of the software application and other related personnel to answer your tech-related questions. Also, expect to walk you through your problems in an efficient manner. Their friendly manner and quick response make them one of better customer support services in the VPN industry. Astrill VPN has done well to build a solid knowledge-base section on the official website. It answers most of the problems that average users encounter when trying to use a VPN service. You can search that section as well in order to find the answers to your questions. Before we talk about the actual installation process, it is a good time to talk about the signup process. Unlike 99 percent of VPN service providers, Astrill VPN has an annoying signup process. All VPN service providers strive to make sure that users are able to become their paying customers fairly easily and quickly. To signup with the service, first you have to confront a CAPTCHA segment. In fact, you will have to do it multiple times as you subscribe to Astrill VPN and download its client. It isn’t a big issue but it is slightly annoying. Perhaps Astrill VPN is trying to stop bots from infiltrating the company’s VPN systems and that’s why they have all these security measures. Astrill VPN also requires a lot of information from its customers to sign up for the service. Then you will get a verification code in the form of a four-digit number. If you can’t or don’t want to enter the four-digit verification code, then you can’t use Astrill VPN. And yes, you can’t even use the free trial without doing so. After confirming the code, you can easily access the client area and then download the client quickly. The installation process itself is short. 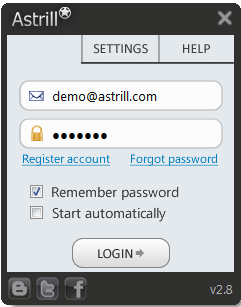 Astrill VPN first confirms the user’s email address and password. Then it connects the user to the company’s VPN servers. 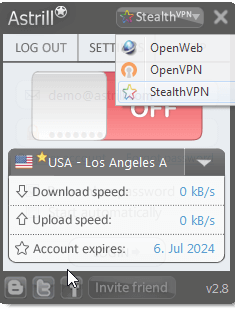 You have to keep in mind that Astrill VPN uses the OpenWeb VPN protocol by default. So you will have to change that by going to the Settings menu. Use the drop-down menu which is located in the top left corner of your client’s screen to access the required menu. As mentioned before as well, the Windows client is great. After you have installed the Astrill VPN client you can find its icon in your operating system’s notification area. That will be on your start bar. From the icon, you can easily control all of Astrill VPN’s features. All you need to do is to click on the Settings option and then have a look at all the available options. If you have connected to the Astrill VPN servers via OpenVPN you should see a lock symbol right next to your VPN server location. As long as Astrill VPN protects you, this lock will keep showing up. If you want to access the drop-down menu where you can select different VPN server locations then you will first have to disconnect from your current VPN server. Only then the Windows client will show you its list of VPN servers. Astrill VPN gives the users the option to enforce features such as DNS leak protection. It also provides options for IPv6 leak protection. By default, Astrill VPN turns them both to ON. There is also an option for WebRTC IP leak protection. Our research for this Astrill VPN shows that its Windows client will stop DNS leaks. And this is built-in feature as far as the Windows client is concerned. Our research shows that you should expect no DNS leaks. Our research also shows that you can expect the Astrill Windows client to protect you against WebRTC leaks. Astrill Windows client if a force to reckon with because it does a solid job of protecting user privacy. Is The Android Client Great As Well? It doesn’t have an OpenVPN option. And doesn’t protect you against DNS leaks. As pointed out earlier, Astrill VPN does offer users a Kill Switch feature. If you want to access this feature you can go to Settings and then to Privacy. After that, you should see the Internet Kill Switch feature option. Once you have activated the feature, the client will protect you against the scenario where your VPN connection drops out and sends unencrypted traffic to your internet service provider. The Kill Switch feature basically works by terminating the user’s internet connection until the Astrill VPN client has connected you to its VPN servers again. The Kill Switch feature is a very valuable option to have. This is a feature that many elite VPN service providers offer to separate themselves from the crowd of VPN service providers. If you go to the official Astrill VPN website compatibility section you will see that the company has listed its Android option at the bottom of the list. The Android client downloads and installs easily and quickly enough. Astrill Android client is really designed for mobile use. And gets to work as soon as the user downloads and then installs the Astrill app. But it doesn’t have the advanced features that the Windows client has. And no DNS leak protection. As mentioned before, our research shows that the Android client doesn’t do anything to protect users from DNS leaks. The Astrill Android client has many other drawbacks as well. It doesn’t have a great variety of encryption options. The Astrill Windows client does offer you plenty of encryption options. Since we recommend users to use OpenVPN, we can’t recommend the Astrill Android client. You can go to sites like speedtest.net and speedof.me to measure how fast your internet connection is with and without a VPN service provider to know how fast your VPN service provider is. Our research shows that Astrill VPN provides users with good connection speeds. Our research for this Astrill VPN review shows that you should expect very little performance drop on any of Astrill VPN’s servers. 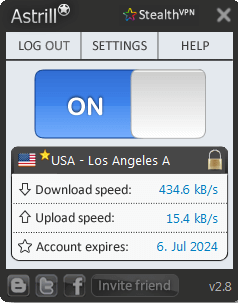 Speed is definitely one of the strong suits of Astrill VPN. We did not find anything that would point to IPv4 DNS leaks when reviewing the Windows client. As pointed out before, the Windows client also has protection against WebRTC leaks. Should you go Astrill VPN as your primary VPN service provider? As always, the answer will depend a lot on your requirements, budgets and other preferences. One the face of it, Astrill VPN looks like a decent VPN service provider. And perhaps it is if we aren’t being too critical. But to better judge if it is the right fit for you let’s take a look at some of the Pros and Cons that each Astrill VPN subscription package will come with. The company offers plenty of encryption options to use with OpenVPN protocol. VPN clients are easy to use. The company does not keep usage logs. Astrill VPN Android client is a disappointment because it doesn’t have the same features as the Windows client. Users have to submit lots of personal information to sign up for the VPN service. If you are the type of user who only works in Windows then Astrill VPN can provide you with a decent VPN service. Because it has a great Windows client. The Windows client may not look the most modern client you have ever seen, but it is value-for-money for sure. We say that because the Astrill Windows client offers many cipher options. That makes Astrill VPN a secure VPN service provider. The company hasn’t said anything about its handshake technology. Neither has it divulged information on the hash authorization it uses. It hasn’t said anything on how it ensures Perfect Forward Secrecy either. And this is a letdown. While the Astrill Windows client is great, its Android version is a bit barebones. In other words, it can’t compete with the Windows version of Astrill VPN client. Firstly because the Android version doesn’t have the OpenVPN protocol option. And our research for this Astrill VPN review shows that it also does not protect users against DNS leaks. That is truly sad since there are more users who surf the web on mobile than there are on the Windows platform. There are lots of reason why Astrill VPN is a good VPN service provider. But there are reasons why it is just an average VPN service provider as well. Astrill is a good VPN service provider if you are only looking to protect your Windows-based machine. And may well give you something for your money. But the Android client is the main problem. It doesn’t have anything that would warrant a payment. That is the reason why we think that you should not go with Astrill VPN as your main VPN service provider. If you want to protect your Android device with a VPN service then there are tons of other better options. Moreover, Astrill VPN, the company, has the problem of not divulging information on some very important issues. Important issues such as encryption implementation information. Most VPN service providers who have good encryption implementation technologies love to boast about them. Since Astrill VPN doesn’t, we have no other choice but to assume the worse. That is, it doesn’t have good encryption despite the ton of options in the company’s Windows VPN client. Astrill is reasonable when it comes to its pricing. And has a strong Windows client to back that up. It offers plenty of encryption options as well. But those options lack strength. Moreover, the Android client is mostly useless as it does not provide any reasonable amount of security.